Washing your RV can seem like a daunting task, but with a few steps it can be done before you know it. I remember washing an RV for a neighbor when I was a teenager. The thing I learned quickly is, take one step at a time. To wash you RV effectively, wash one section of the RV at a time. Taking the time to wash your RV one step at a time will make the job simple and effective. Start on the top of the RV, then proceed to the sides, and the front and back. Finish with the tires and windows if desired. If your RV has been sitting a while, or hasn't gotten a washed in a long time, your job might be a bit more difficult. 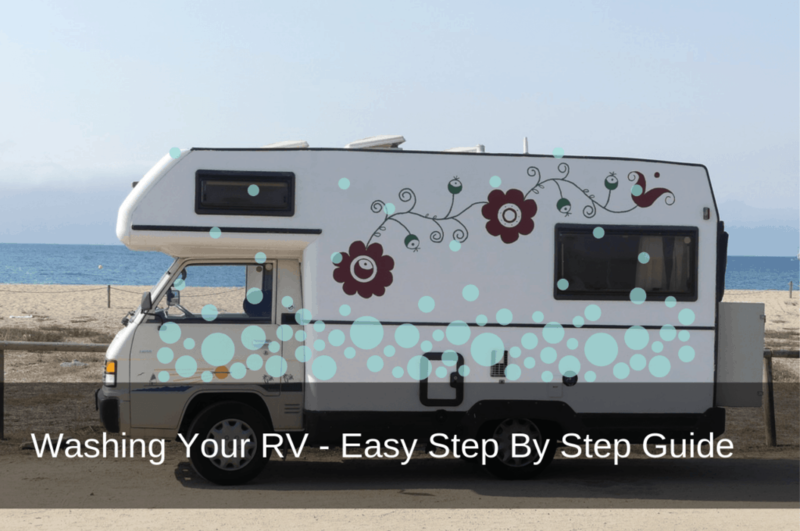 I'll share some tips for getting off the grim, so you can more easily wash your RV within the time limits and in the way you want to. 2. Choose a Method - Soft Brush, Dry Wax, or Washing Service. If your RV has baked on dirt and grime, it's helpful to use a pre-wash. Normal washing with soap and water will not remove all bugs, tar, and stuck on particles. A pre-wash (Amazon Link) can loosen up stuck on particles and help clean the surface without harming your paint, fiberglass, or metal surface. Just check to see if the one you choose can be used on your type of RV surface. Use the pre-wash soap or spray and wait the time period indicated, usually 2 minutes. Then wipe off with a microfiber towel or soft scrubbing towel to remove bugs, tar, and grime. 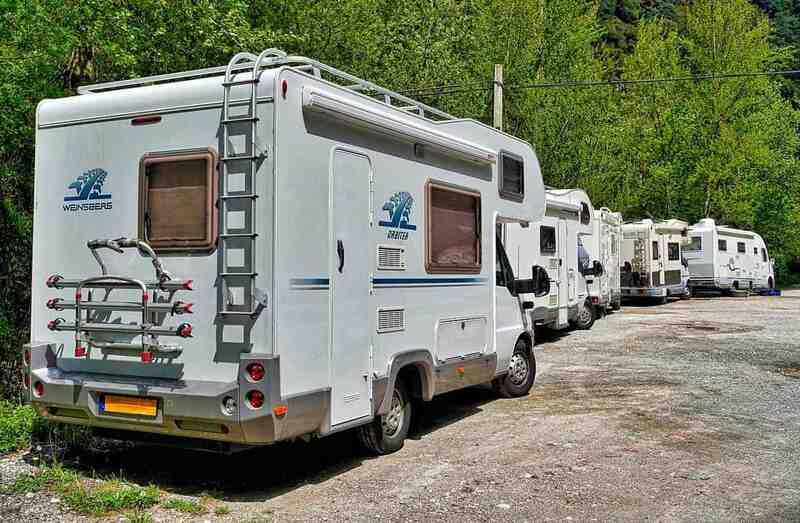 If you have a heavy accumulation of grime, you may need to go over the area once more with the pre-wash or see how things turn out after you wash the RV. If your not interested in using a pre-wash product, pre-soaking is another alternative you can use to help lifting off some of the more stubborn stuck on particles. Just use water or soapy water (Amazon Link) and spray or quickly apply over entire area to be clean. Let the water sit for a couple minutes or more before scrubbing with a brush, soap, and water. Working in the shade will help the water penetrate longer to remove grime, for an easier job. a) An easy method for cleaning your RV is to use a soft brush with an extension pole, soap, and water. With an extension pole (Amazon Link) for your brush you can cover large areas in a short amount of time. b) If your RV is dirty but not full of grime, choosing dry wax can save you time and water. Just spray (Amazon Link) on or apply the wax (Amazon Link) to the surface of the RV and wipe off. Be aware that a dry wax will only clean light dirt, but will leave your RV with a nice shine for a couple of weeks. c) Washing services are available for a cost at some RV parks. They can wash all the areas of your RV, including the top, sides, wheels, etc. If you have the money, this might be a good option for you. Expect to pay $200+ depending on the size of your RV. All three methods have their benefits . To help you decide, think about how much time and money you are willing to spend on your RV and you'll likely know which is the best option for you. Here are some things to things to think about before choosing. Soft Brush - Water and soap can be cost effective when using water efficiently. Dry Wax- A spray on wax takes only one step and uses a microfiber cloth and spay, so no extra equipment is needed. Washing Services - Helpful when you need some extra help or just the convenience. Make sure you have everything you need before you start and set aside enough time. Some people like to tackle one section at a time, to avoid frustration and do a thorough job cleaning. How much will you do? A lot of people like to start by cleaning the top of the RV. This is a good idea if your planning to use soap and water. The dirt, soap, and water will need to drip down and so cleaning the top first means you wont need to clean the sides twice. Start by making sure you have the correct cleaner for your RV. Wash the RV with soap and water or use dry wax. Wash the fiberglass safe soap and water or use dry wax. Most mild cleaners will work. If you want to remove oxidation get an aluminum care wash. Using a backpack to carry items would be helpful when climbing on the roof. Use extreme caution if cleaning on the roof and using a ladder. Secure ladders well to the ground and using a 75 degree angle is usually the safest. Check any ladder that is bolted to the back of the RV, is fastened securely. Rinsing with a power washer is not advised. If you do decide to use one, use it from the ground level. Power washer can cause water to enter the rivets, seams, and hatches. RV design decals can peal off with power washers. A garden water hose with a nozzle will usually work fine in most circumstances. If you do have a power washer, a safe way to use it on your RV is for applying soap. Attach a soap dispenser (Amazon Link) and foam down the area to be washed. This will help keep the area moist and lubricated for an effective cleaning. You may need a ladder and a helper to hold the ladder. Some RV have a ladder added to gain access to top of the RV. Not all RVs have a top that can be walked on. Check your owners manual. Make sure to check labels well to ensure your RV surface can be cleaned with the product your looking for. Also, use car wash soap because some dish soaps can harm the clear coat of painted surfaces. 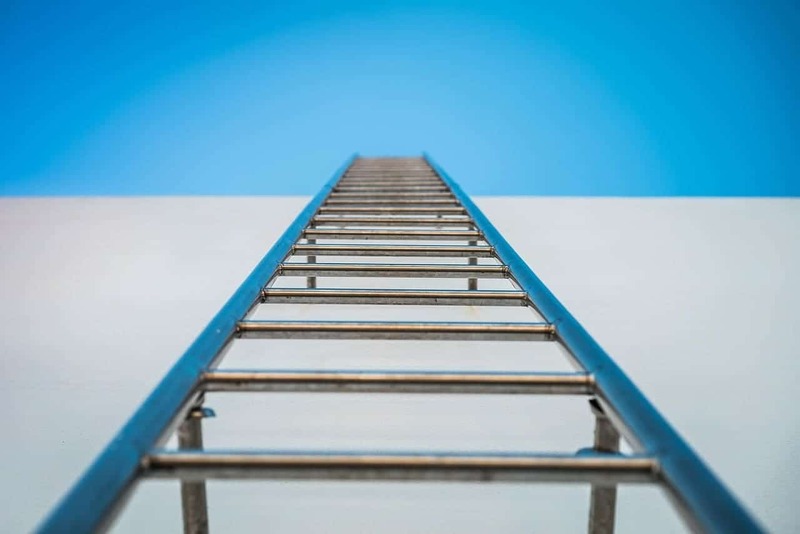 After you've finished cleaning the top of your RV, check that you have all your materials, place them in your backpack and carefully climb down the ladder using both hands. A soft brush on a pole can come in very handy when washing the sides of your RV. If using a dry wax a step ladder (Amazon Link) or collapsing ladder (Amazon Link) will be needed for hard to reach areas. Be cautious of areas that shouldn't be sprayed directly with force. Check to see if everything is closed tight. Sliding windows, Vents, and seals for slide outs should be carefully sprayed around lightly. Check to see if you slide outs and awnings need to be cleaned. To clean the awning, try not to scrub or power wash. Soap and water can be applied and sprayed off gently. 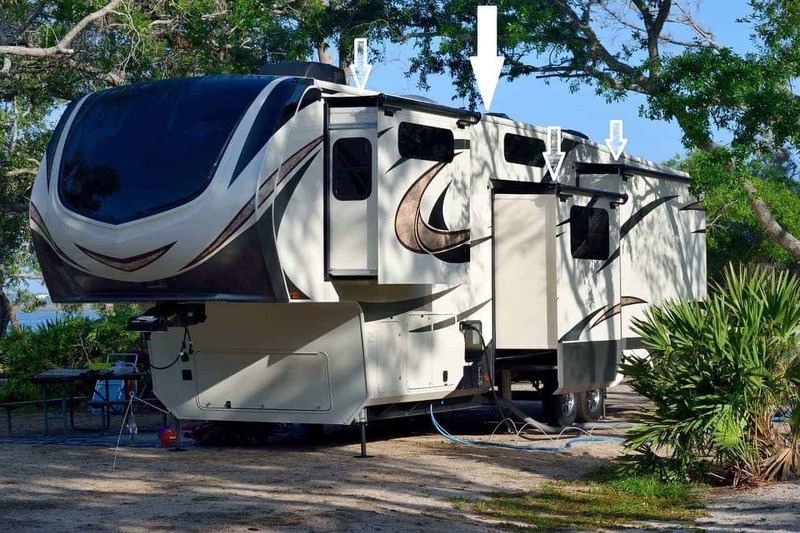 Some awning arms can detach, allowing the fabric to lay flat against the RV. This will help you clean it more effectively. After cleaning the sides, check your rubber seals and decide if you want to use a rubber conditioner (Amazon Link) to make sure they are in good working order. Cleaning the front and back should be similar to cleaning the sides. Check to see if the windows and other compartment are fully closed. Wash or clean in your RV until your satisfied. Check to see if you need to removed any items stored in the back. Washing or cleaning may be more difficult around tight areas, and water or spray may get into areas you may want to avoid. This is a good time to inspect how secure things are tied down. Check cargo on back of RV, hatches, vents, ladders, doors, and other ground level items. Washing one's tire rims can get a bit dirty. If using a dry wax, it helps to wear gloves and have a stool to sit on when cleaning. When cleaning with soap and water it is helpful to have a tire brush (Amazon Link). The grim will rinse off a brush, but stick to a rag, although rags clean better in my experience. 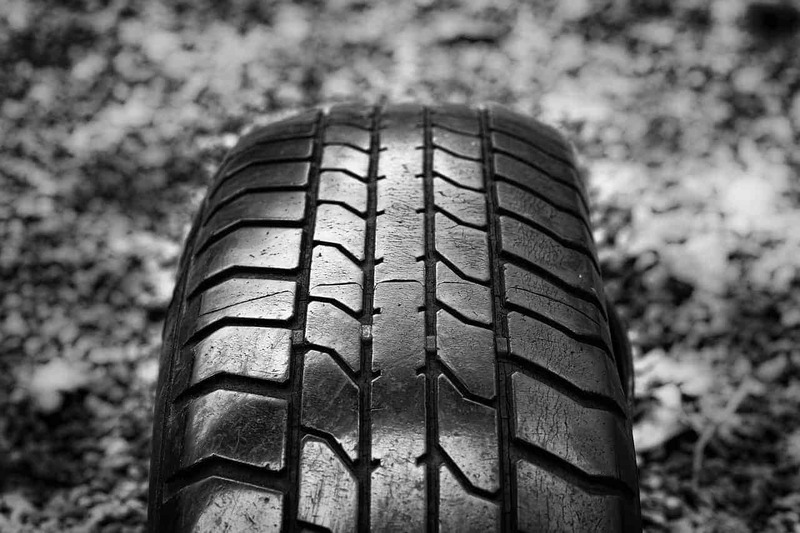 Tires can get dry and cracked if RV owner don't use their RV often. 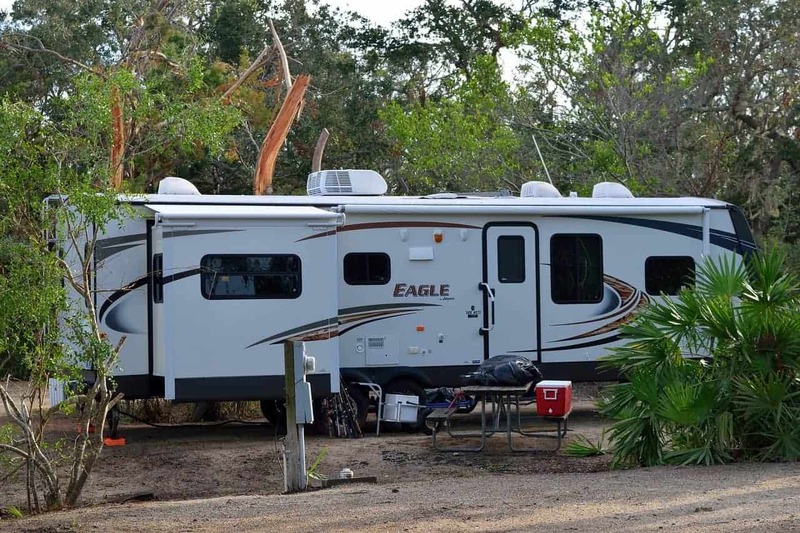 A good practice is to use tire covers, tire conditioner spray (Amazon Link), or regularly use your RV. Check to see if your rims are securely fastened, tire lug nuts look fastened well, and do a visual inspection of the tire tread depth. Lots of problems can be solved when checking for problems before they happen. The nice thing about the some wax sprays, is they can be used on windows as well. Some people just skip this step, since windows wipe or dry fairly clean most of the time. If your serious about making sure your windows are clean and spot free, invest in a good window cleaner (Amazon Link). It's helpful to wipe down the windshield wipers and ensure they are cleaned well. Checking for small cracks in the windshield can help prevent costly replacement of entire windshield. Some cracks and chips and be patched before the crack spreads. Check the area where the hood meets the front window and clear any debris so the window cleaner can spray from the nozzles effectively. Check the windshield wipers and see if they need to be replaced. Shopping around can help you find a good deal. 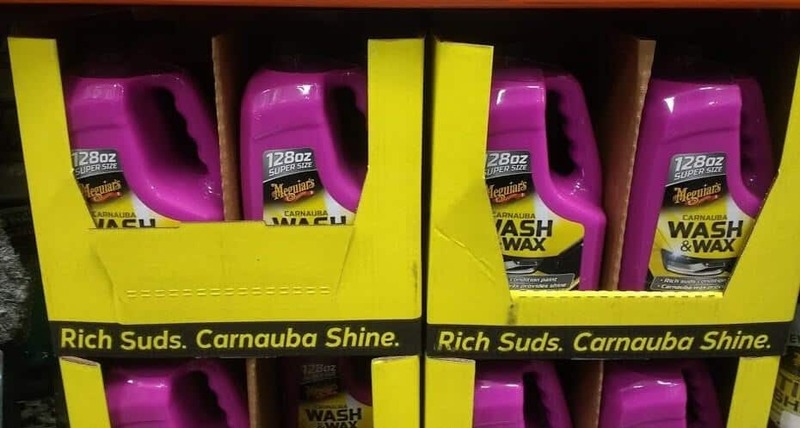 I found these items at my local Costco. 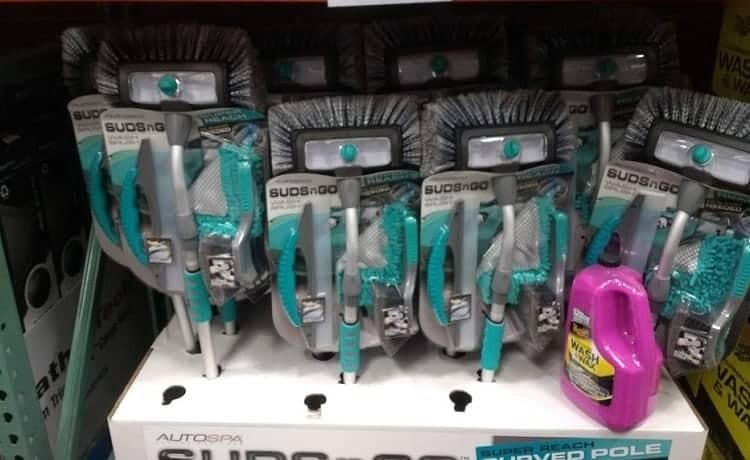 Some big box stores might have some of the items you need to clean your RV. 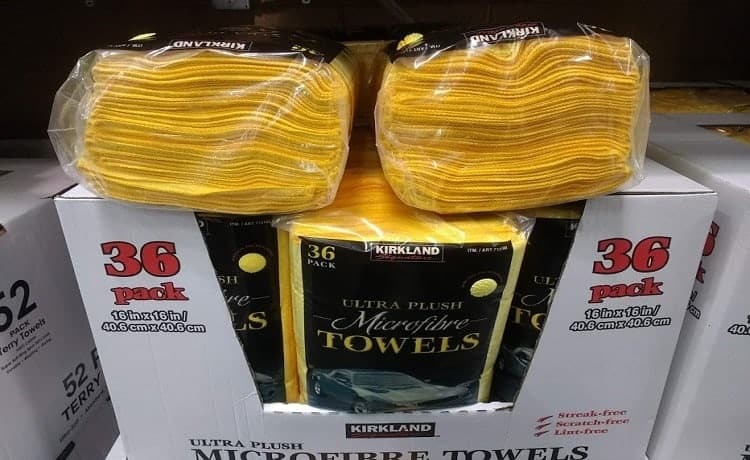 Should I use a microfiber towel to clean my vehicle? Yes. A microfiber towel can clean surfaces on your vehicle effectively. It can be thick for soaking up water or thin for finer detail work. They are inexpensive, and made of polyester, polyamides, and polypropylene. It is usually safe for vehicles, but get ones that are designed for vehicles to be safe. What's another way to remove bugs from my vehicle? You can try a dryer sheet for bug removal. Wet the dryer sheet and rub the area affected. The bugs should start to loosen. Additionally you can use a spray bottle with a half of cup of water and shake well. When your finished, clean the area with soap and water.